The DOD FX54 Attacker was supposed to be awesome – in 1991. And by some rights it probably was. While combining “a smooth, tight compressor with a wide range distortion” it brought “unlimited guitar sounds ranging from a warm Larry Carlton type sound, to a bright, hard rock sound like Joe Satriani.” Except it was loud and the distortion wasn’t that pleasant. After sitting in a box unused for a few years, then later stripped of its paint and returned to box, it was decided to muck about with the circuit to see if any interesting sounds could be had. There are a lot of mods for a lot of pedals that enhance the sound by replacing components with better ones. I won’t profess to know enough about electronics to be able to make a bad pedal sound good so this was more an adventure of bending. Three possible options and sound samples. Did I mention I don’t play guitar? At all? Good. Space inside the enclosure is limited. Opted to go with 2 and 3 each connected to a switch. A trimmer possibly would have fit to adjust the tremelo but a full size pot would likely require a breakout box of some sort or repurposing one of the existing controls. The result is a pedal that went from never being used to becoming something with limited/novelty use. And some fun poking about inside. wow…the switches look great. it’s amazing you were able to fit both of those in there. trimmer? like an internal trim pot such as one in the Red Witch Empress Chorus? 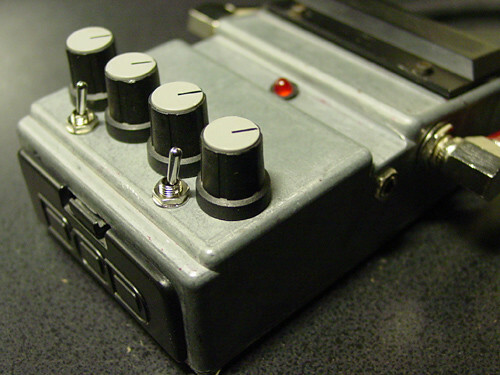 or external like those small knobs on the Zvex ring modulator? Internal style but accessible from the outside maybe? Tight squeeze for sure. DOD FX54 Attacker mod. 0 comments.